Our SE Florida Holiday Season offshore action is in full swing as we approach the Thanksgiving Holiday! Thanksgiving is a time to pause and take stock of all of the blessings that have been bestowed upon us and our families and friends. We would like to take this opportunity to express our sincere thanks and appreciation to every single one of our incredible clients who fished with the Lady Pamela II Team in 2018! You are the “reason for the season” all year long. Without you, we are nothing and we hope that you enjoy fishing with us and feel appreciated by the entire team…because you are. As you set aside your turkey for its slow thaw over the next few days, let’s talk about the bite and recent catches. Sportfishing Report: Sushi On Parade! 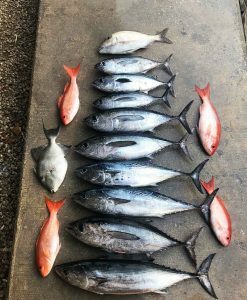 The Blackfin Tuna bite has been on an incredible hot streak over the past month. The Blackfins have been abundant in huge schools out to 300 feet of water. The Blackfins have been in the 5-10 pound range and continue to respond to trolled blue/white combination Sea Witches and Bonito Strips with black/red skirts. We typically troll them at 5 – 6 knots. There have also been a few Wahoos hanging around the schools (they like sushi even more than we do) and several clients hooked them on the troll as well. Mahi Mahi are still around although not in the numbers that we had been encountering. During the fall, we’ll encounter fewer Mahi but the average size is a healthy 15-30 pounds or more. We’ve been finding the Mahi between 400 and 2,000 feet of water on rigged ballyhoo, bonito strips and Islanders, mostly on our way out to the Swordfishing grounds. 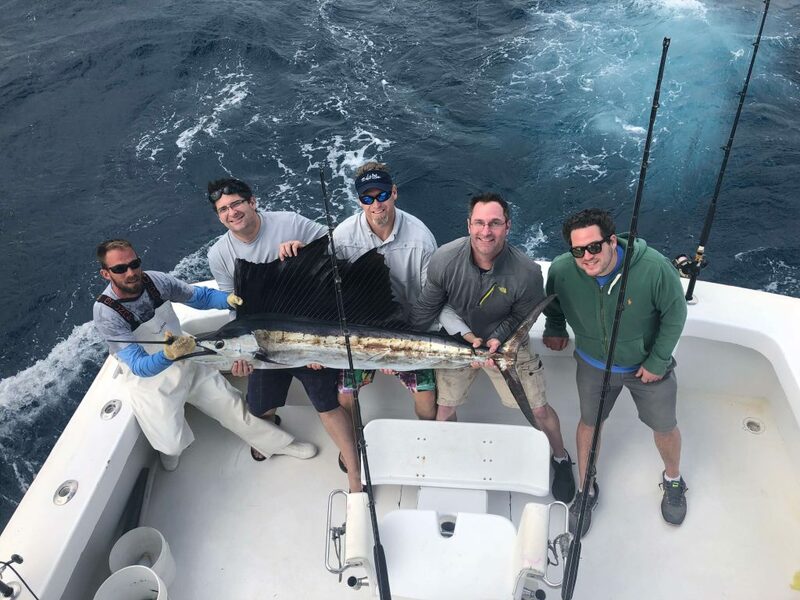 Speaking of Swordfishing, our daytime Swordfish trips have been averaging 3 or more bites with most trips returning to the dock with several of these amazing, world-class game fish. 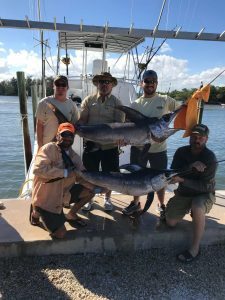 You have to try “Daytiming” for Swordfish to truly appreciate a fishery that attracts anglers from all over the globe to SE Florida. We are at the epicenter of Daytime Swordfishing. Soem anglers will fish areas of the world for just ONE bite while the Lady Pamela II Team is averaging 3-6 bites PER TRIP or more! Give us a call for more information on this truly unique angling experience. Our clients have enjoyed stellar Sailfishing as our fleet has switched over to fishing live baits underneath our fishing kites for multiple catches. We can fish up to three (3) live baits per kite, with at least two (2) kites up at any one time. We’re fishing between 90 and 250 feet of water. We’ve also had luck shallower than 90 feet as we watch Sailfish cartwheel in the midst of Ballyhoo schools up on the reef. Kite-fishing is an amazing and engaging experience as you get to see the Sailfish AS THEY EAT the bait. Nothing gets the blood pumping like watching a double- or triple-header Sailfish bite up on the surface. The shark fishing has been fantastic as the Fall bait migrations served to boost the shark bite. However, we hosted a loyal client who had one thing on his mind: Catch a big Thresher Shark. You see, we at the Lady Pamela II love to take requests. Our crew leveraged our experience and “secret sauce” to help our client catch this 12+ foot Thresher Shark below! Of course, Threshers are known as fighters and this specimen would not go down without a fight. She managed to drag our mate into the water as we brought her along boatside! However, there was a happy ending as both mate and Thresher were released without harm to live to fight another day. As for the rest of our shark fishing trips, we continue to put clients on big sharks, with each trip landing at least one shark, with most trips catching several. Hammerhead Sharks continue to be the favorite of our clients.Caribbean Reef Sharks and Silky Sharks have been active but we’re also seeing the influx of Blacktip Sharks and Spinner Sharks feeding near shore on the migrating mullet schools. The best shark baits continue to be Bonito or Kingfish dropped down in 300 feet of water. We’ve also been fishing live and cut mullet for the Blacktips and Spinner Sharks. We’ve also been putting our clients on huge Amberjacks with live bait when shark fishing. Amberjacks will certainly test the stamina of both tackle and angler! The Lois Ann continues to be in drydock as we perform scheduled maintenance and upgrade her powerplant and other systems to make our clients even more comfortable as they put meat on the deck. Lois Ann should be back in service shortly after Thanksgiving and she will hit the water with a vengeance as we’ll be in the middle of prime time for Yellowtail Snappers, Mangrove Snappers and the Big Daddy: Mutton Snappers. We also expect to resume our hot streak with Kingfish and Amberjacks. Event though Thanksgiving is a time to gather with family and friends, come join your Fishing Family in the days that follow Thanksgiving for a second-helping of Offshore Excitement! Call us to book a trip and let the Lady Pamela II Team introduce you our exceptional Fort Lauderdale offshore fishing instead of taking a nap on the couch in front of the television. Gobble Gobble!